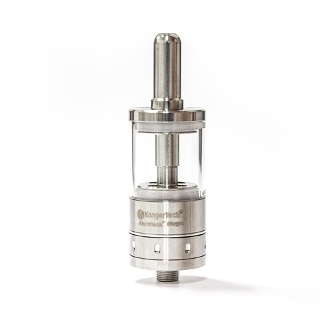 We are happy to introduce to you the Kanger Aerotank Mega. This great clearomizer is the big brother to the Original Kanger Aerotank. It's bigger, more powerful and we recommend keeping it in the family. Kanger has added innovation and design to their already tried and true features; It holds 3.8ml of your choice of e-liquid and comes standard with the option to switch from a Pyrex glass tank to a stainless steel tube depending on your preferences. They have also redesigned the airflow valve and given this great clearomizer a more updated, streamlined look. The Aerotank Mega is a 510 threaded clearomizer, which means it will fit on any 510 or eGo threaded battery though it is recommended to use one of our more powerful batteries such as the 1600mAh EMOW. Using a powerful battery such as the 1600 EMOW will help to ensure that the powerful Aerotank Mega is properly accommodated. Flip over and unscrew the tank from the base. Fill the tank, being careful to not fill past the connection hole. Also make sure to keep liquid out of the center metal tube. Unscrew the coil head from the base and replace with a fresh one. When filling your clearomizer, avoid getting liquid into the metal tube at the center of the tank. When filling your tank, the coil heads can become loose when unscrewing the base from the tank. Always make sure to tighten the coils heads anytime you remove the base.